Stewardship of a neighborhood is a mentality. Maintaining the beauty of local streets and trees requires more than a few passionate individuals, but the commitment of a community at large­. A neighborhood can only truly transform when any given resident stops to pick up a piece of trash or remembers to curb their dog –without thinking twice. That’s how stewardship works best; it’s the key to improving our daily space exponentially. The challenge: Casting stewardship in a positive light. Penalties and fines may reduce littering but also leads to resentment. Who wants to live amid bitter neighbors? This past year, Curb Allure was lucky enough to be involved in “Love Your Tree,” an initiative that helped solved this riddle. How our initiative evolved serves as a terrific template for others who want to foster street stewardship in their own communities. 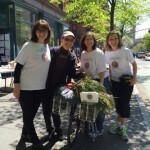 Last year, a group of civic leaders on the Upper West Side of Manhattan –West 80’s Block Association, Goddard Riverside Greenkeepers, Community Board 7 and Curb Allure, and others– joined forces with District 7 City Council Member, Helen Rosenthal to launch “Love Your Tree” Day. On a lovely May afternoon, neighbors convened for refreshments before setting out to clean up streets and tree beds. Each participant received a free tree care bag containing a dog reminder sign as well as other tree care necessities donated by local businesses. By introducing street care in a fun, social way, “Love Your Tree” hoped to instill residents with a sense of responsibility for the beauty of their block. The plan worked. 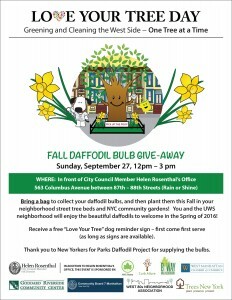 “Love Your Tree” Day received such a positive response that the group hosted Daffodil Day on September 27th. Within the first half hour of this three-hour event, the “Love Your Tree” organizers had already run out of bulbs! 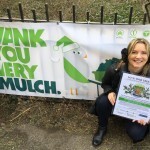 The New York City Department of Parks and Recreation took note and invited our new initiative to co-host the popular MulchFest at West 83rd and Riverside, one of the city’s main mulching stations, along with the Riverside Parks Conservancy, Trees New York, NYC Department of Sanitation and GreeNYC. As evidenced by the schedule below, the “Love Your Street” initiative (newly re-branded to encompass all aspects of street care) already has a full calendar planned for this year. Curb Allure Founder Kim Johnson is optimistic that there’s more growth to come. “We cannot wait to see what else 2016 will bring,” she says. 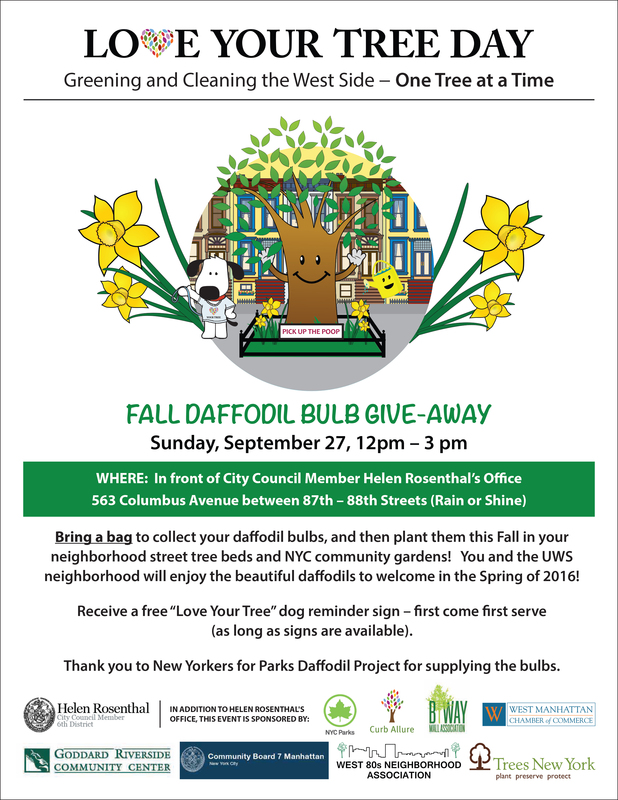 “Hopefully other NYC neighborhoods as well as other cities will get inspired by our program and its success to start their own beautification initiatives.” Stewardship might not just be a mentality, but a contagious one at that. It’s official. New York City has become a bike-riding town. The number of commuters biking to work has nearly tripled since 2002, according to a NYC Department of Transportation (DOT) study. 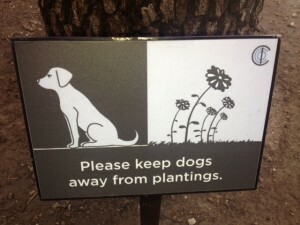 This is fantastic news…unless you are a tree mistaken for a bike rack. Does this scene look familiar to you? Luckily, there’s an easy fix: CityRacks bike racks provided by the DOT to accommodate any type of bicycle or locking system. Even better, CityRacks bike racks are free. To obtain one, fill out this downloadable form to request installation of a bike rack in your area. If approved, your location will be added to a list for manufacturing and installation. Your rack will become the city’s property, meaning NYC will take responsibility for all maintenance. 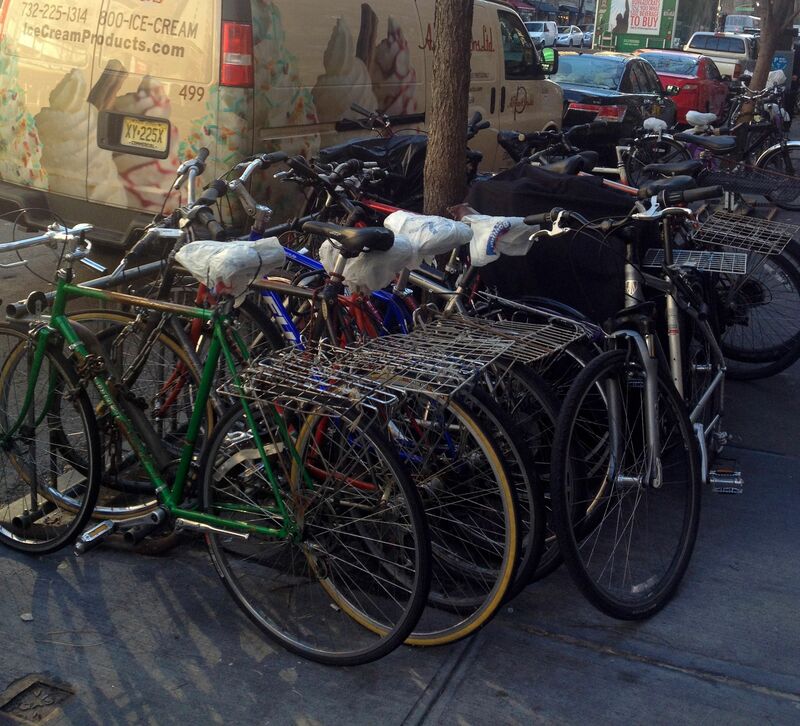 New York will not, however, take care of our bicycles. These racks are designed for temporary bike parking not full-time housing. Real estate is scarce enough in this town! CityRacks can not be installed on pavers, cobblestone, brick, stone, slate, or custom or patterned concrete. You’ll also need to be patient. Due to growing demand, the DOT estimates a wait time of six months before it can even review your request. For those who want bike racks for spring 2016, now is the ideal time to start. In the meantime, keep peddling, New Yorkers! Even those of us smitten with “big city living” crave something smaller every now and then. A sense of community is good for society, good for the environment, and good for the soul. But how do you capture that small-town spirit in allegedly anonymous cities like New York? Luckily that anonymity is a myth. New York City is actually a mass of small towns –aka “neighborhoods”— each possessing its own character, legacy and network of people. Before long, most New Yorkers know their local dry cleaner, deli workers and coffee barista. And if you want to plant even deeper roots, there are plenty of ways to build closer neighborhood ties. As is the case with many things in our beloved city, you might have to work a little harder to do so. How’s this for an idea? Start a Block Association. 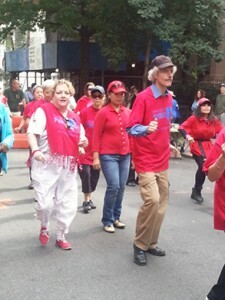 “When you have a neighborhood association, you are creating your own little village; creating a little encapsulated world inside a much larger organism that is a city,” explains Gail Dubov, who heads the West 83rd St, which is believed to be the oldest neighborhood association in New York City. Fifty years ago, a group of dog walkers started the organization in response to the infamous Kitty Genovese murder in Queens in which neighbors failed to respond to her cries for help. Today, Dubov describes spending evenings sitting outside with various neighbors catching up on the news. 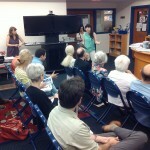 The group still meets every other month hosting guest speakers such as Borough President Gale Brewer. “I feel like West 83rd is a village,” she says. These groups can also really make things happen. 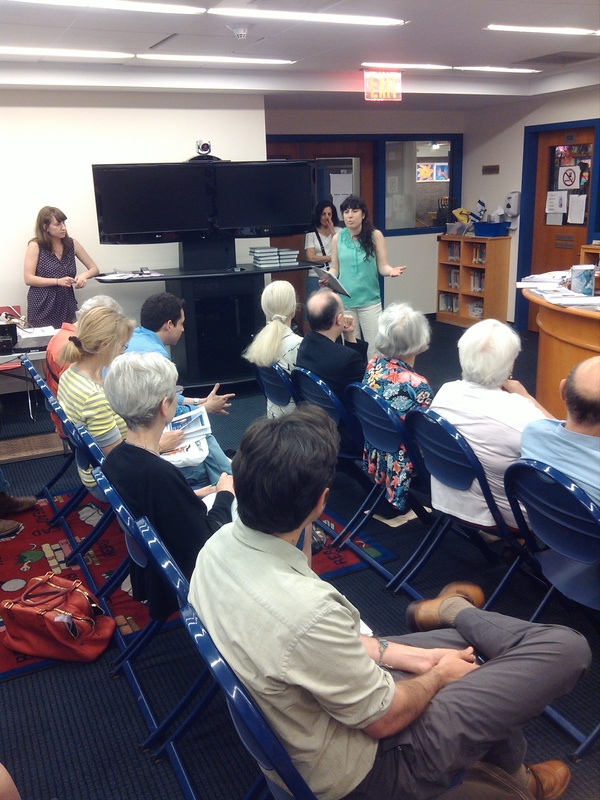 The West 83rd Street Association recently participated in a pilot program for compositing. 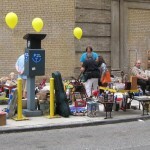 In years past, they’ve held auctions offering each other services –i.e. a ride to the airport, two hours of babysitting etc.— and used the proceeds for neighborhood improvements. They’ve contributed to playgrounds, police departments and biking initiatives. building a community garden? Talk to your neighbors to find out or even pass out a survey. “It’s always best to find something that everyone can rally around,” says Dubov. Then look into what can be done. As the Citizens Committee for New York City points out: “If your goal is to plant a community garden, for instance, you’ll want to know who owns the available space, how you can get access to it, who in the neighborhood will help with the garden and what resources exist to help you.” Also set a clear definition of who will be included in your association. Is it a single block or an entire neighborhood? How you answer makes a huge difference. With parameters clearly defined, pull together a core group. 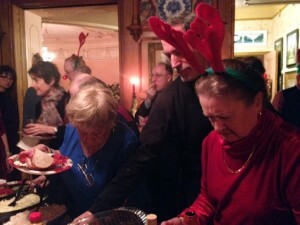 This can consist of friends, co-op board members or anyone with a vested interest in the community. Meet with your core people to define goals and divvy up the work. You’ll be amazed to discover your neighbors’ hidden talents. Finally, get the rest of the community involved through a general meeting. Invite neighbors to attend by passing out flyers. You can even canvas the neighborhood by going door-to-door and introducing yourself. Prepare a few lines of introduction so that your message is clear and consistent. Once you’ve gotten the word out, plan a general meeting. The Citizens Committee recommends holding the event in a public space, such as a church or community center. Not only is this easy for residents to find, but it also gets these institutions involved from the outset. The meeting itself should be well organized with a clear agenda and plenty of opportunities for people to get involved. And serving coffee and dessert can’t hurt either! For more information about “Getting Started”, check out this wonderful tip sheet from the Citizens Committee for New York City. What city’s image is more closely linked to trees than Washington DC? 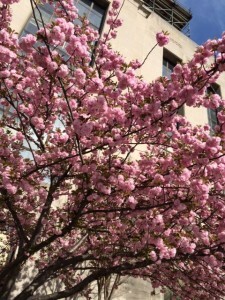 Home of the storied cherry blossoms, DC refers to its tree bed as “tree boxes.” And while the most famous cherry blossoms dwell in the National Mall, others –like the tree pictured right—grace the streets of residential and business districts. To help people create the most sustainable “tree boxes,” Casey Trees, a DC-based organization, provides a super informative Tree Space Design handbook to highlight the best practice for street tree care in the DC area. 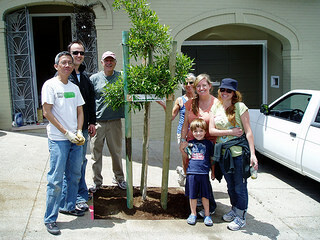 The City of San Francisco uses the term “tree basin.” In the photo above, a few city residents of the Potrero Hill neighborhood proudly display their new tree, which they received and planted with the help of Friends of the Urban Forest (www.fuf.net). Friends of the Urban Forest provides an amazing array of programs for tree planting, care and community outreach. 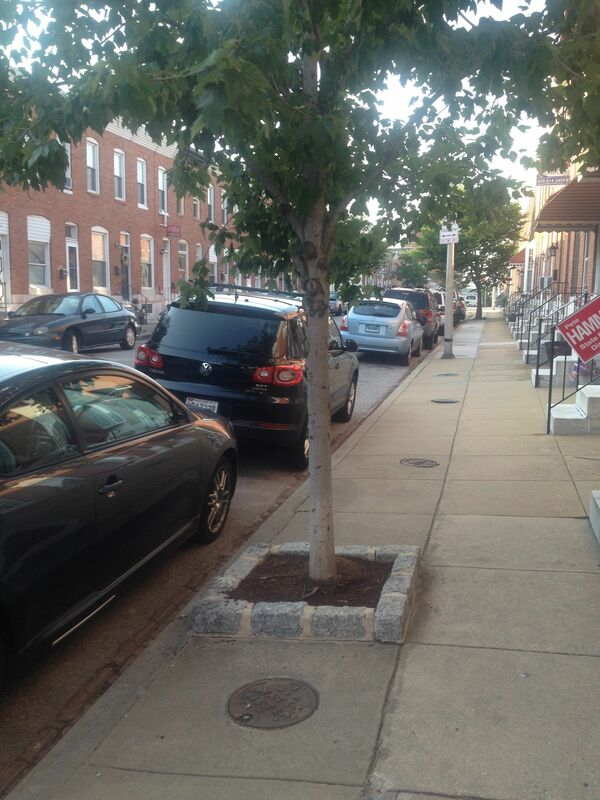 They even help with tree replacement for empty tree basins like this one below. In addition, City of San Francisco provides this useful guide for sidewalks & basin care. Philadelphia, which adheres to the tried-and-true term “tree pit,” has adapted some of the most innovative practices around. 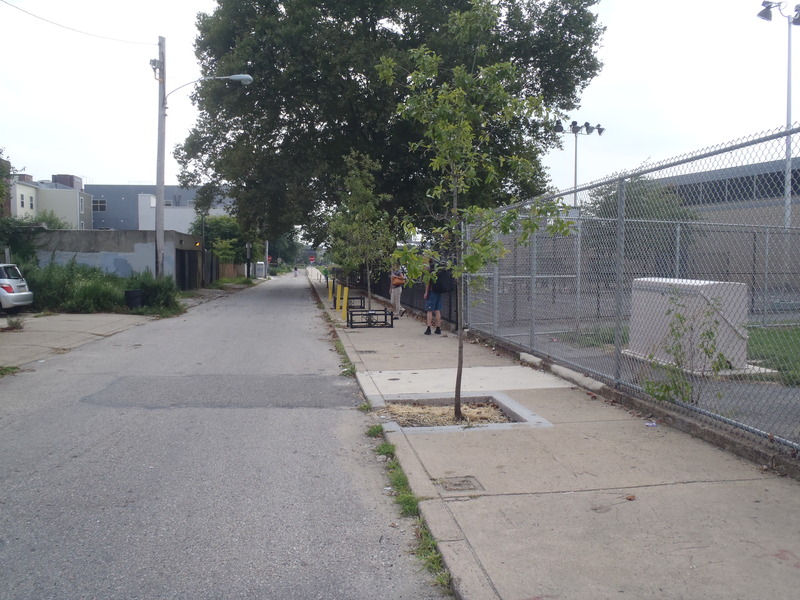 To help remove excess storm water from the street, Philadelphia Parks & Recreations joined forces with Philadelphia Water Department to create tree pits that are level with the ground. Boston is another “tree pit” city. 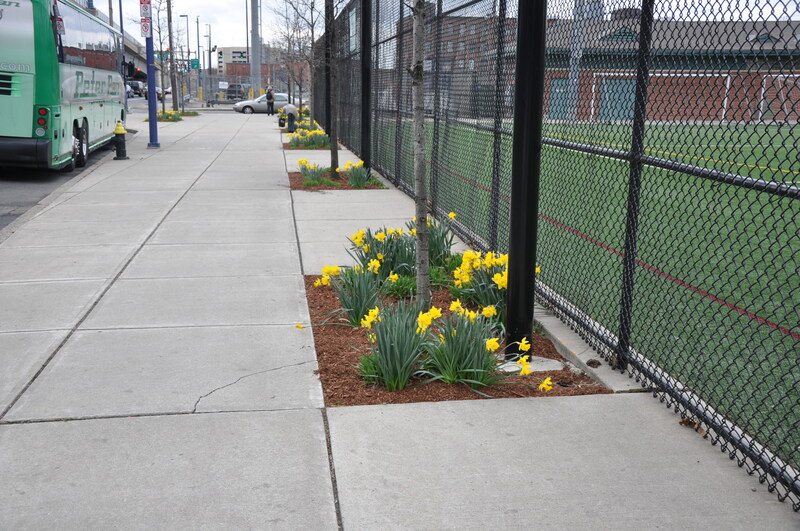 As you can see below, Beantown sports some lovely tree pits, particularly in the early spring. Surely, snow-bound Bostonians dream of the return of these gorgeous daffodils. No matter what people call them, these patches of land unilaterally serve as beautiful city oases in which green things can take root, grow and spread fresh air and joy to the people below. Take note, a tree bed by any other name is truly just as sweet. 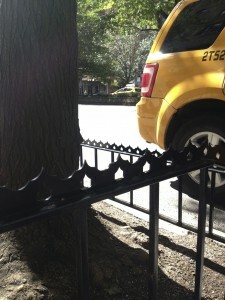 Why Do We Need A Tree Guard Permit in NYC? 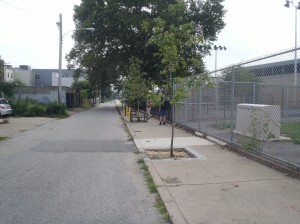 For those of us who love to garden outside, going inside to file a permit with our local government to install tree guards –fencing that actually make our streets beautiful—seems a bit silly. Trust us. This is paperwork well worth the effort in gaining your tree guard permit for NYC. 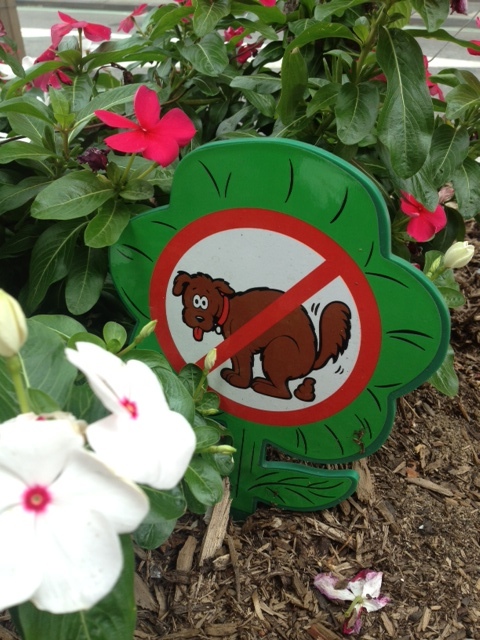 Not only will tree guard permits help protect you from lawsuits, they also prevent trees from dying prematurely. Here in New York, we’ve witnessed repeatedly how tree guard permits improve the lives of you, your neighbors and your trees. Nothing ruins that warm neighborly feeling like an ugly lawsuit. Yet, that’s exactly what may happen if a pedestrian trips over your tree box fencing. 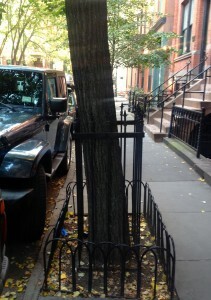 A tree guard permit for NYC will reduce a tree guard owner’s liability in these types of situations. Better yet, obtaining a tree guard permit to install your tree bed guard can prevent this unfortunate situation from occurring all together. Here are a few New York City Parks & Recreation Department requirements for installing tree pit guards that ensure pedestrian safety. 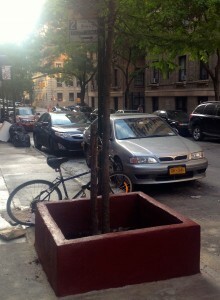 To keep folks from nose-diving into the geraniums, tree guards must be over 18 inches in New York City, and preferably made out of metal. Low borders made of wood, concrete, or blocks (pictured above) are difficult to spot for visually impaired pedestrians. They are also obstructed by even the lowest of snow banks, creating a tripping hazard for the most cautious walkers…. or a similar problem arises with this flat guard whose subterranean pit creates a hole that could easily catch someone’s foot. 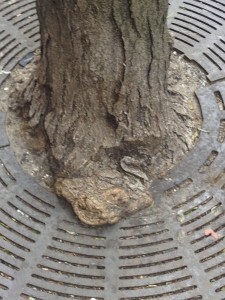 Maple trees grow bulky roots that cause grated fencing to buckle, forming perilous bumps on the sidewalk. As a result, some cities do not allow planting certain species of trees, including Norway Maples. 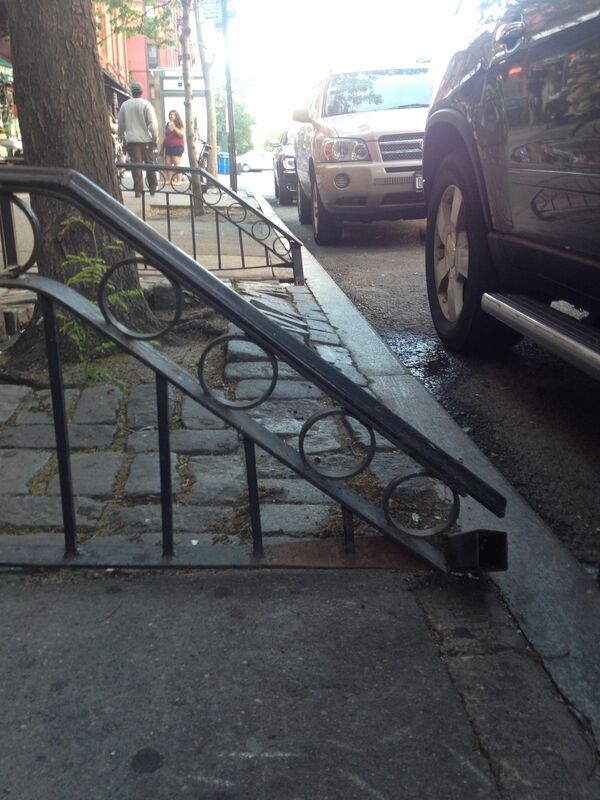 New York City has banned grates altogether since they are neither safe for pedestrians nor trees (see above). Would you want your preschooler practicing her balancing skills on one of these razor edges? We didn’t think so. 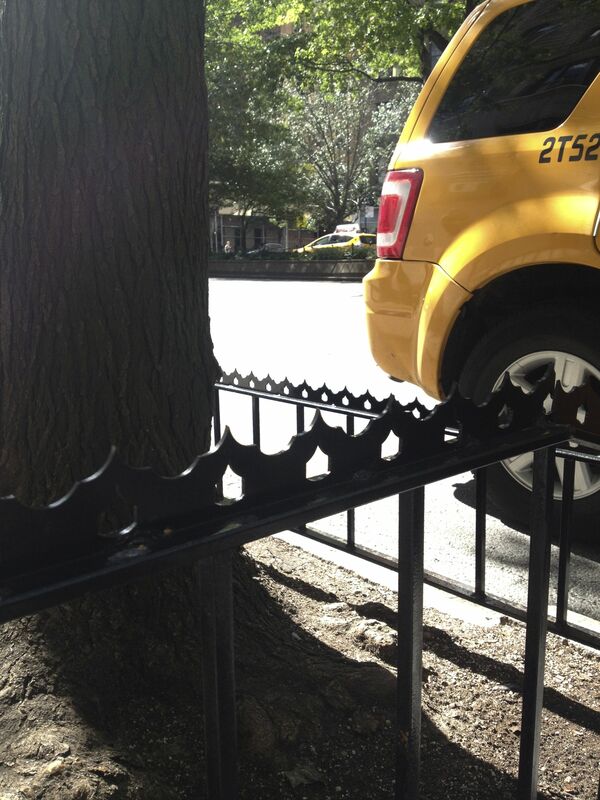 New York City no longer issues tree guard permits to tree fence designs with excessively sharp edges or sit spikes. Talk about cutting it close! 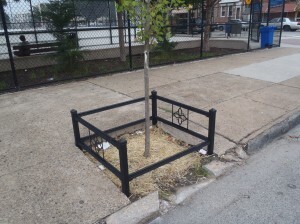 This tree guard was damaged because it sits way too near the street –a layout that can also injure people stepping out of cars. New York City Parks Department recommends that tree fencing remains at least 12 inch away from the front of the curb. 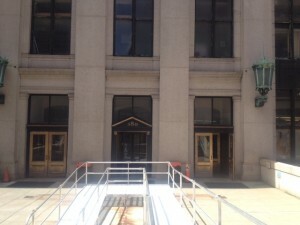 The City also prefers three-side guards to avoid this problem. Not all tree pit guards are good for trees. Some styles of tree fencing deny street trees of water, drainage, soil or room to grow. A tree guard permit helps rule out designs most detrimental to the health of trees, so that yours thrive for years to come. Tree trunks grow wider as they age (Sound familiar?). That’s another reason New York City no longer allows grates. 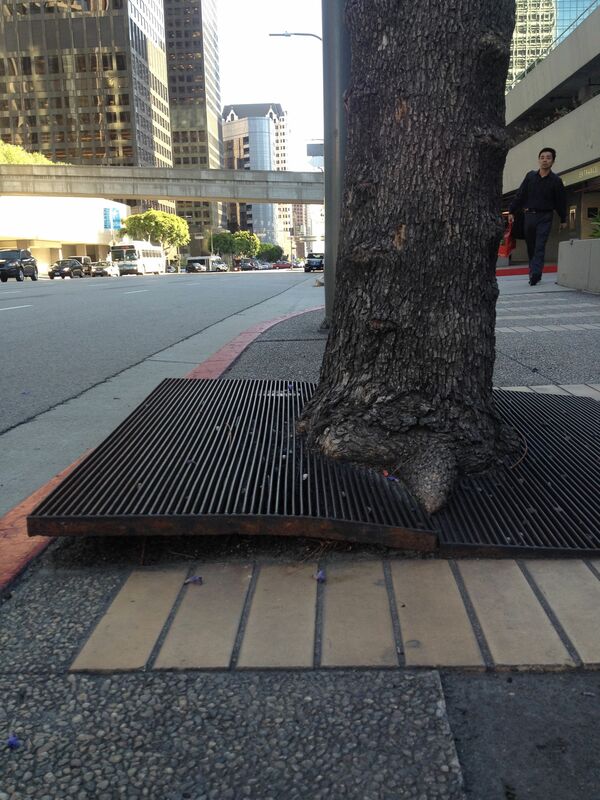 As you can see above, grate fencing will girdle (or choke) a tree over time. 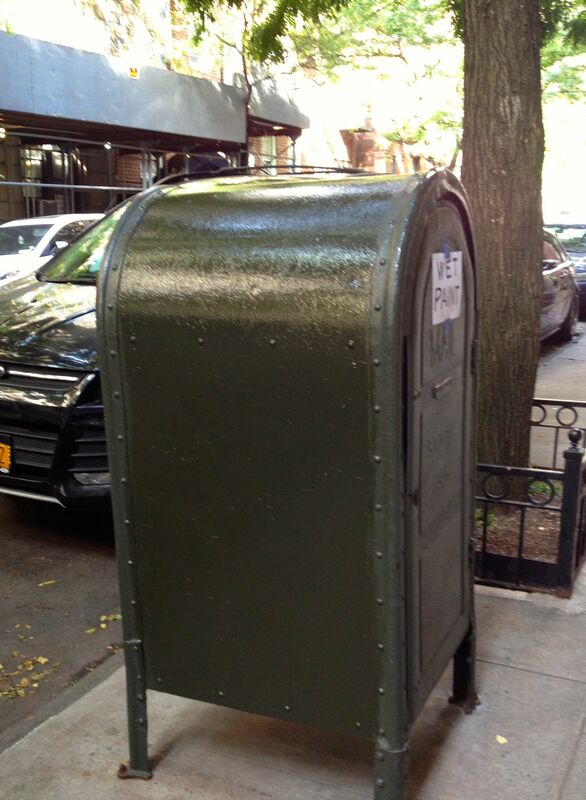 New York City no longer allows solid-walled guards, which can rot trunks, compact soil and limit trees’ water supply. That’s especially problematic for young trees that need lots and lots of water to grow. Notice how spindly the tree above looks? 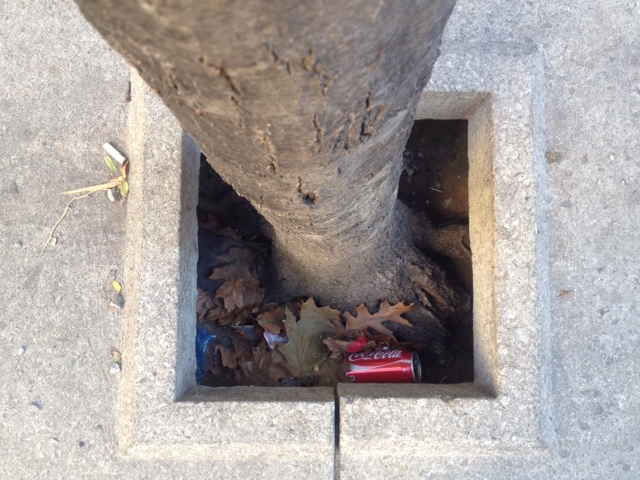 Sunken tree pits collect wet leaves, damp soil and garbage that may damage the trunk and lead to health problems. Also notice how small this tree pit is. Just imagine how cramped this tree will be in a few years. Up until the 20th century, these tall tree fences served as a fashionable means of preventing horses from damaging tree trunks. We no longer have such problems. The old ‘Horse Guard’ tends to strangle slanting trees. 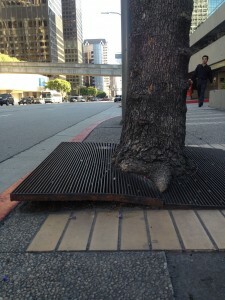 And urban trees usually lean to seek sunlight through tall buildings or bend to the currents of wind tunnels. Tree trunks also do not grow in perfect circles, like this circular ‘horse guard’ assumes. 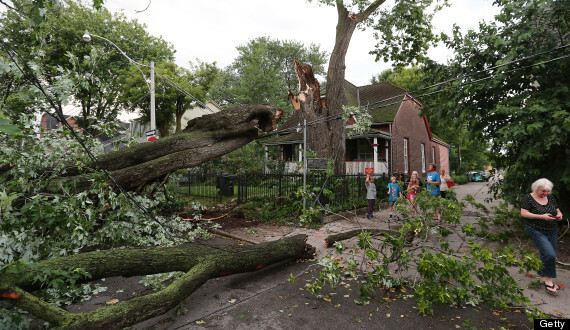 To avoid this issue, New York City limits tree guards to 24 inches in height, and requires as much space as possible between a guard and tree trunk. Luckily, submitting a tree guard permit in New York City is very simple. Just fill out one page (click here) and send the form along with a photo of the tree guard you plan to install to Central Forestry (Attention: PERMITS) via email at treeplanting.permits@parks.nyc.gov or fax to (718) 760-6640 or (718) 760-6940. We suggest you submit as soon as possible, since the application can take up to 3 weeks to process. In NYC, there is no fee for the permit. 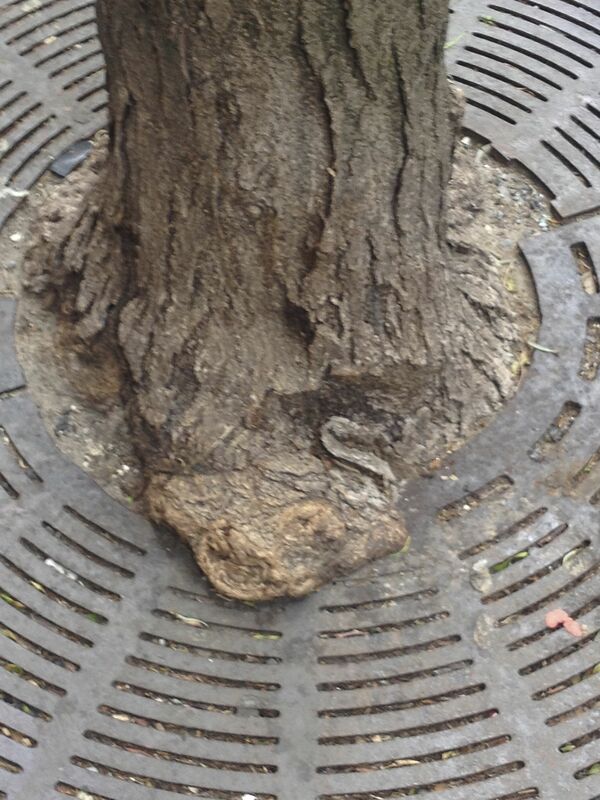 Better yet, NYC Parks Department provides this easy-to-follow set of guidelines for the dos and don’ts of street tree care. Download them here. And, now that you’re done, get back outside and garden! 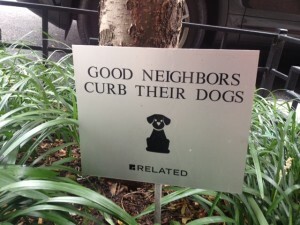 Keeping your street beautiful may seem merely like a cosmetic concern, yet statistics show that the cleaner, more well-maintained, and –yes— leafier a neighborhood, the more benefits enjoyed by all. 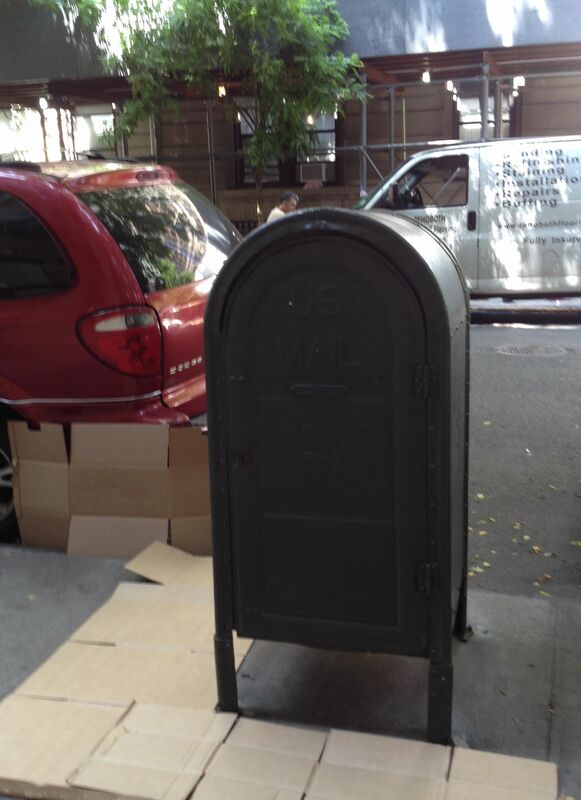 Researchers left a cash-filled envelope sticking out of a mailbox with the money in plain view of pedestrians. 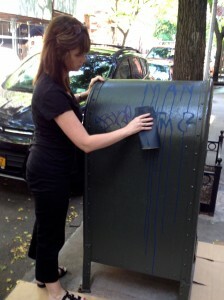 One mailbox was covered with graffiti, while the others were clean. A quarter of the people walking by stole from the graffiti-covered mailbox whereas only 13% took the envelope from the clean one. On a wall where people leave their bikes, researchers posted a “No Graffiti” sign and then left flyers on each of the bicycles. Next they added graffiti to the wall despite their own warnings. Of the 80 bicycles monitored, 69% littered the wall with graffiti, as opposed to just 33% on the wall without. Our sad looking neighborhood mailbox. Step 1. Become A Post Box Care Captain. Contact your local post office to find out about the program. In New York City, you can call Cherry Liu at the US Postal Service (email: Cherry.C.Liu@usps.gov), who will provide the application form to fill out and return. Within one week of submission, Ms. Liu called us back with our approval and information about where to obtain the materials. Step 2. Pick Up Materials. 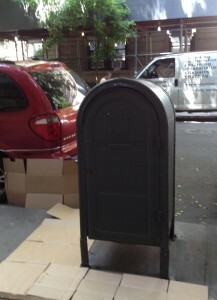 In New York City, we went to 380 W 33rd St. to Room 4061 (Entrance pictured above), where I received a can of blue paint for my mailbox and green paint for my relay box (these ones serve as holding areas for mail so letter carriers do not have to carry all of their routes at once). I discovered that to care for both relay and mailboxes, you must adopt two of each. In addition, you are required to specify your adoption territory (i.e. : East 75th to East 77th between Park and 5th Avenues). Not only is maintaining boxes very close to your house much easier, but you care more since you’ve got to look at those boxes every day. Rather than a drop cloth, we just used some old cardboard. Step 3. Keep It Tidy. 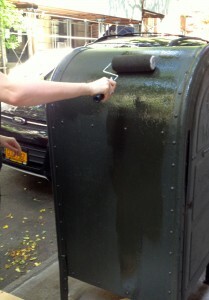 To avoid dripping paint all over the sidewalk (very counterproductive given that we’re combating graffiti! 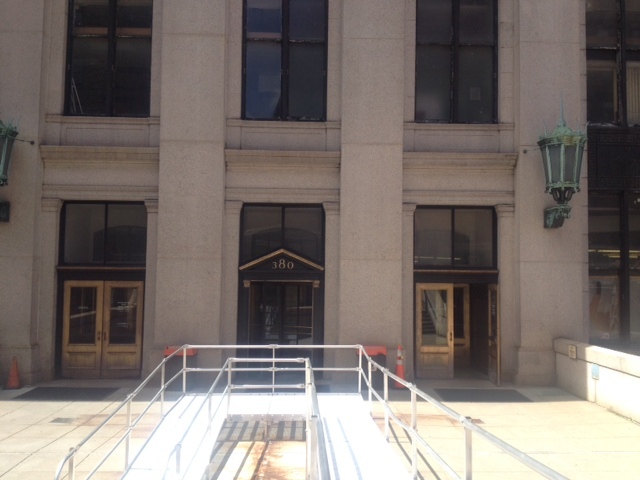 ), put down a drop cloth or just use cardboard boxes to protect the sidewalk as well as nearby cars. Cover the key hole with tape to ensure no paint gets inside. Step 4. Smooth Things Out. Sand any rusted spots if necessary. Step 5. Start Painting, Already! 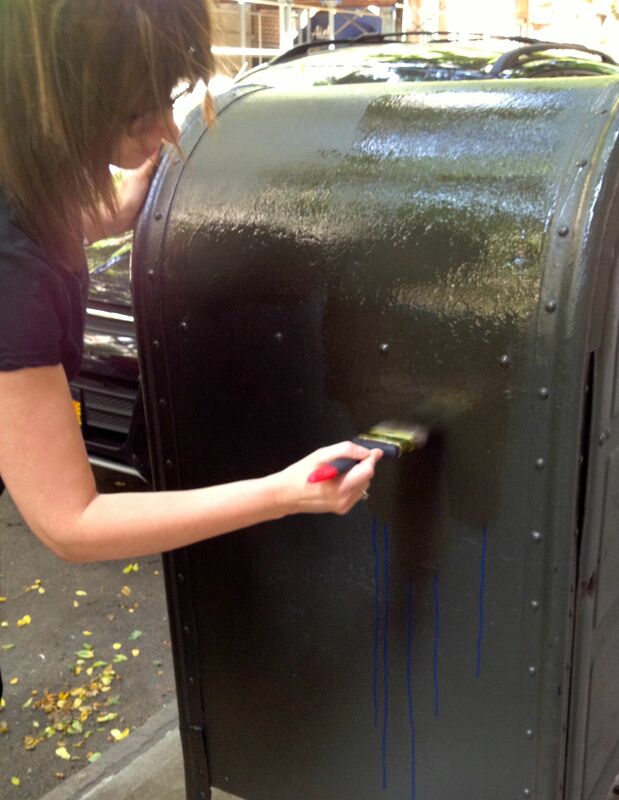 To get this part right, we suggest painting over the graffiti with a brush and then again with a roller. This way, you get nice even strokes. Step 6. Don’t Forget The Wet Paint Sign. Ack! No one wants to ruin your work of art nor do they want green paint on their shorts. Step 7. Enjoy Results. Repeat. Look at the glorious fruits of our labor! 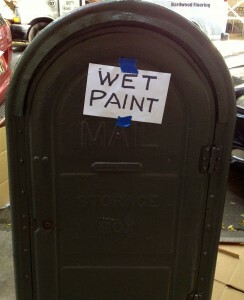 The idea behind “Adopt-A-Mailbox” is that people take better care of their surroundings when they have a sense of ownership. They’re 100% right. When we finished sprucing up our mailbox, we were practically glowing with satisfaction. We think we may have spotted the trees nodding with approval too. 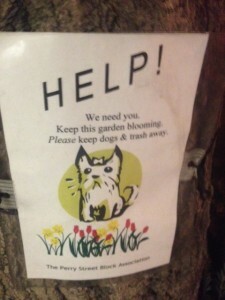 This entry was posted in Gardening, Mailboxes, Tree Garden: Turning Tree Pits into Urban Garden Opportunities, Uncategorized, Urban Forestry and tagged block associations, gardening, New York City, planting, street trees, tree guards on June 26, 2014 by amy. Every morning, trees tell us about the coming day, as their branches catch a gust of wind or cast a shadow off the rising sun. They mark each new season too, offering hopeful buds in Spring and gold-tinged leaves in Autumn. And they link us to generations past and future. Thirty years from now, our grandchildren could enjoy the shade of our favorite oak tree. Trees connect us to our surroundings and to one another. This concept serves as a driving force behind our work at Curb Allure. Today on our fourth anniversary, we cannot think of a better way to celebrate than to share the story of Toronto (hometown of founder Kim Johnson) and its very special Maple Leaf Forever tree. 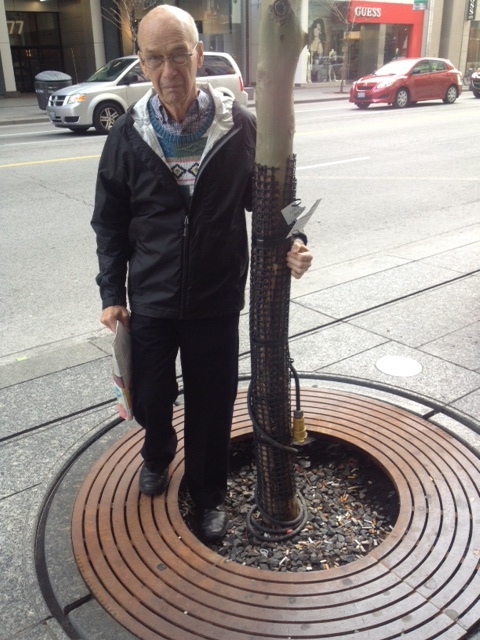 This giant maple on Laing Street was said to inspire Alexander Muir to write “Maple Leaf Forever” , the beloved unofficial national anthem and poem of Canada. According to the Toronto Public Library, Muir came up with the song when he was strolling by the tree in front of his house in 1867 and a maple leaf fell on his shoulder. For nearly 150 years, the Maple Leaf Forever tree stood as a testimony to Canada’s pride in both its national identity and profound natural beauty. 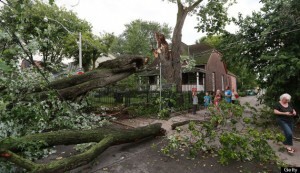 Then, last July, a fierce storm knocked over the giant tree, devastating Canadians throughout the world. Determined to keep the Maple Leaf Forever alive, last month, the City of Toronto milled logs from the fallen tree and distributed them to 150 local artists, as reported in the Toronto Star. Many of the projects will be displayed publically throughout the city, including 30 wig stands to be donated to cancer patients. While certainly the most noteworthy, the Maple Leaf Forever is just one of many fallen trees that Toronto has repurposed through an ongoing project. Here is their directory of Urban Wood Products and Services: www.toronto.ca/urbanwooddirectory. 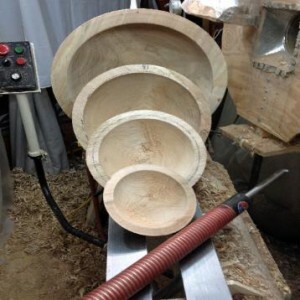 Michael Finkelstein made these beautiful nesting bowls out of Maple Leaf Forever wood. Art isn’t the only way the Maple Leaf Forever lives on. 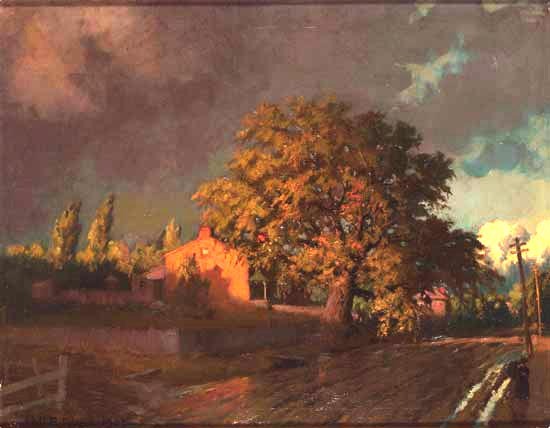 In 2000, engineer Bill Wrigley took maple keys from the original tree and planted them in his backyard, according to the Toronto Star. One sapling survived. Seven years later, Wrigley received permission to move the sapling to the Maple Leaf Forever Park, right near its “Mama Tree.” And, today, visitors can find comfort in seeing the historic tree’s “Baby”. 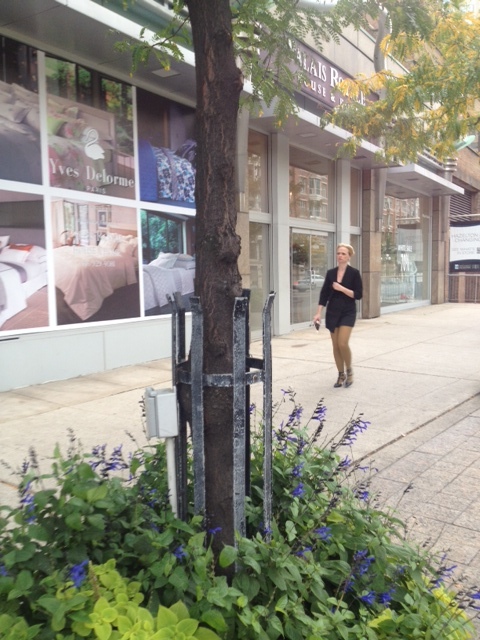 Curb Allure is deeply honored that the City of Toronto has asked to use one of our tree guards –with two different custom-designed panels—to protect the offspring of the Maple Leaf Forever tree. Keep an eye out for images of this special guard, which we will happily share following the dedication ceremony in late May. Thanks to the ingenuity and passion of these Torontonians, the legacy of the Maple Leaf Forever continues. Living trees require similar dedication from their community. If we want our neighborhood trees to welcome the next generation, it is up to us to protect them. And, as the Maple Leaf Forever and The City of Toronto have taught us, trees are well worth the trouble. This entry was posted in Giving, Tree Garden: Turning Tree Pits into Urban Garden Opportunities, Uncategorized, Urban Forestry and tagged Canada, Maple Leaf Forever Tree, street trees, tree guards, urban forests on April 24, 2014 by amy. Curb Allure exists “because every street deserves to be beautiful” (Pssst. That’s even our tagline!) Yet as we work closely with cities, neighborhood organizations and other community-minded groups, we often see how challenging achieving this goal can be. Growing and maintaining trees, flowers and green spaces requires a lot of work and money, especially for local grassroots organizations who depend upon volunteers and donations. Luckily, resources are available to those who dare to ask. 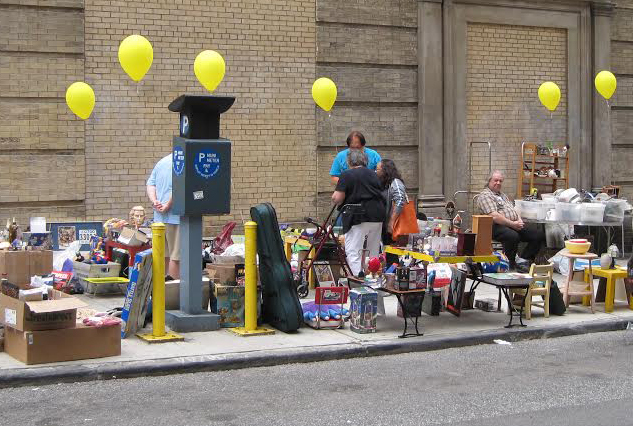 Here is a list of mini-grants available in New York City to help launch your favorite neighborhood project. Citizens Committee for NYC is a non-profit organization dedicated to “helping New Yorkers —especially those in low-income areas— come together and improve the quality of life in their neighborhoods.” As one of its many grant programs, Neighborhood Grants awards resident-led groups up to $3000 for projects that focus on improving community or schools throughout NYC. Recent recipients have transformed empty lots into community gardens, organized tenants to advocate for better housing conditions, and started school recycling drives. Citizens Committee for NYC has also partnered with New York City services to forge Love Your Block which provides grants to improve and beautify City neighborhoods. Through this program, not only can resident-led volunteer groups receive up to $1000 in funding, but they also get a little extra help from the Departments of Transportation, Parks and Recreation, and Sanitation. For example, Love Your Block grants have provided assistance for tree removal, tree planting, garbage pickup and providing wood chip mulch for gardening projects. Due Date: Late 2014/Early 2015. Exact dates to be announced. For grant guidelines, click here. 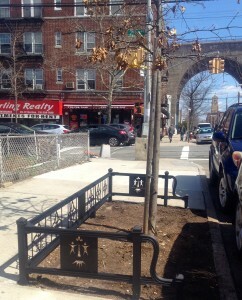 New York City Department of Sanitation will provide small amounts of free compost and mulch to improve the soil in NYC street tree beds. In exchange, recipients must display official NYC Compost and Mulch signs (provided at pickup). Those requesting mulch or compost must be able to pick up bags and physically load them from one of the DSNY compost and mulch distribution locations. Trees on private property do not qualify. New York City public or charter schools who are registered with Grow to Learn, the city-wide school garden initiative, may receive funding to create or expand their school garden. Grow to Learn recognizes gardens in all shapes and sizes, including ones within classrooms, on rooftops or via partnerships with community gardens. Amount: Up to $50,000, depending upon the population of the municipality. Cost-share grants. The New York State Department of Environmental Conservation (DEC) annually announces the availability of community state assistance grants for tree planting and urban forestry projects. These grants are reimbursement cost-share grants that must be equally matched by local resources. 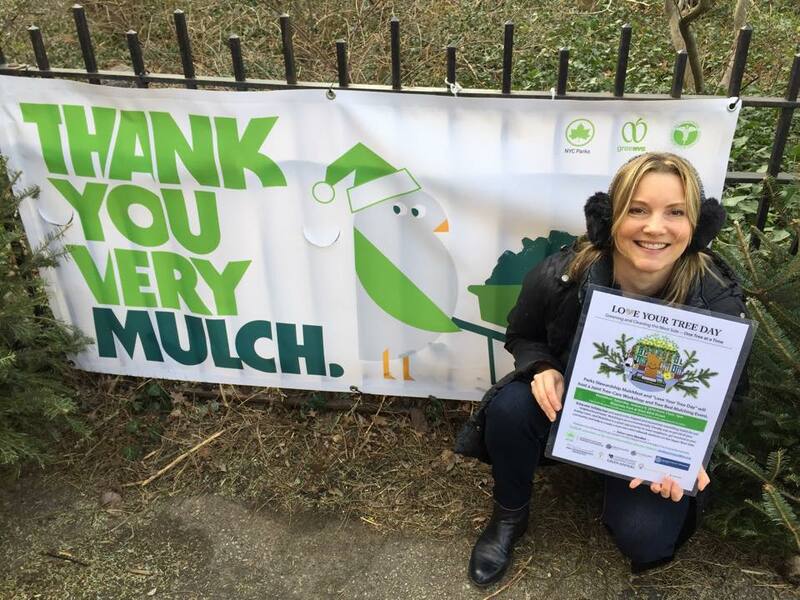 This entry was posted in Gardening, Giving, Tree Garden: Turning Tree Pits into Urban Garden Opportunities, Urban Forestry and tagged flowers, funding, gardening, grants, neighborhood, trees, urban forestry on February 25, 2014 by amy. The holidays are a time for giving. So, if you’re strapped for ideas on those last minute gifts, consider donating to a cause that matters to your loved ones and supports urban forest protection. At Curb Allure, we have dedicated ourselves to the belief that trees and gardens are the lungs (and souls) of our communities. If this resonates with you or someone you love, here’s a list of wonderful organizations that could use your donations for urban forest protection. 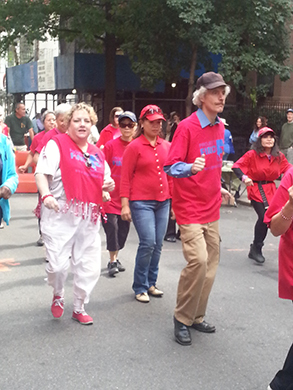 We know first-hand that each of these groups make a real difference, namely in our hometown New York City. Based on our experience, donors cannot go wrong with any of these nonprofits to support urban forest protection. However, we are curious about who’s making an impact in your community. What’s your favorite tree, garden or parks organization? We’d love to hear. Happy Holidays. 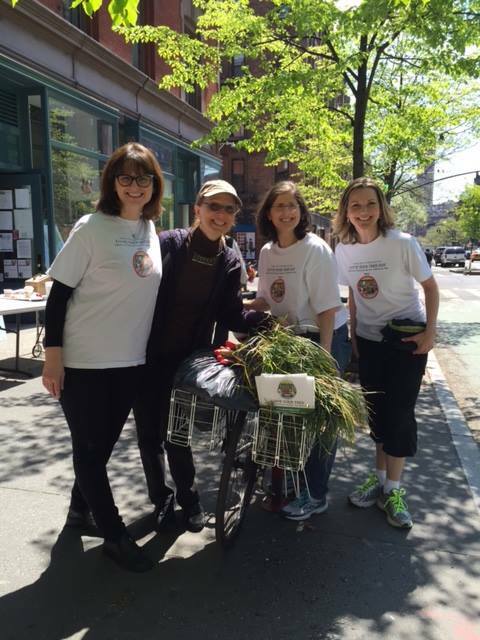 This entry was posted in Giving, Tree Garden: Turning Tree Pits into Urban Garden Opportunities, Urban Forestry and tagged donations, environment, holiday giving, New York City, urban forests on December 19, 2013 by amy. 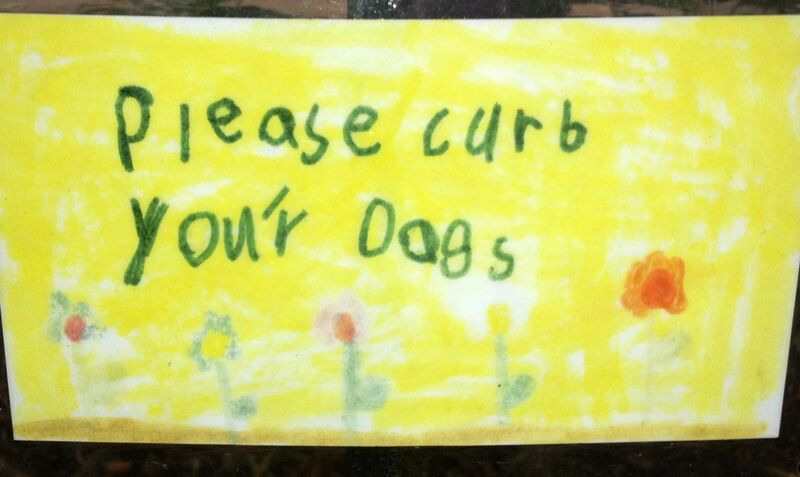 Or a goofy dog inside a flower curb your dog sign, as shown on Bleeker Street. 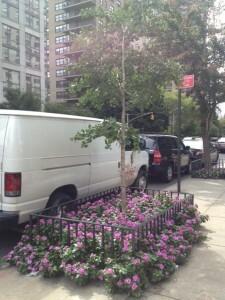 An abundance of flowers surrounding the urban tree & tree guard make for a natural deterrent. 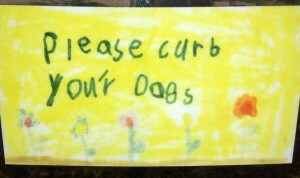 Curb Your Dog Signs do not need to be fancy.